Enviro-One™ Multi-Use Green Cleaner is our most powerful but gentle concentrate formula. It is composed of non-ionic surfactants and a powerful aqueous organic solvent made from the fatty acids of edible and seed bearing plants. Enviro-One Multi-Use Green Cleaner is a colloidal micelle solution that create a unique hydrocarbon release agent that lifts oils, dirt, grease, grime, dust and stains to be rinsed away without damaging or reaction with the surface being cleaned. Enviro-One™ Multi-Use Green Cleaner can be used on just about any washable surface including: plastics, fabrics, concrete, faux finishes, foods, personal hygiene and more. 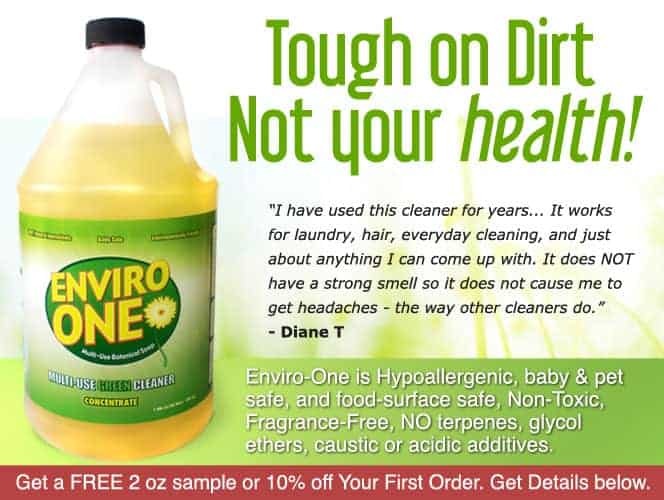 Enviro-One™ Multi-Use Green Cleaner Replaces All Harmful Toxic Cleaners. Personal care, household cleaning, pet care and industrial use. Some common uses are: baby bath, bath and body wash, bathroom cleaner, carpet cleaner, degreaser, denture cleanser, flea bath, pet shampoo, fruit and vegetable wash, grout cleaner, jewelry cleaner, kitchen cleaner, laundry soap, liquid dish soap, shampoo, shaving cream, soap, spot treatment, stain remover, tub & tile cleaner and waterless hand wash.
Enviro-One Multi-Use Green Cleaner has the finest ingredients and has no Genetically Modified Organisms (GNO) in them. Our products has been tested in the marketplace since 2006 and is gaining popularity in the MCS & environmentally conscious community. Below is a list of the ingredients found in our products. Purified water, fatty acids, organic alcohol (sugarcane), folic acid, minerals and enzymes derived from edible and seed bearing plants.